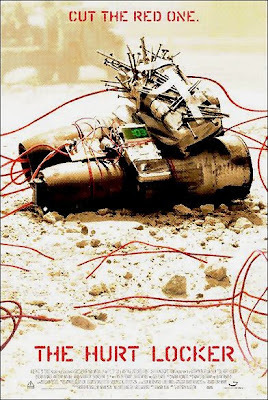 Kathryn Bigelow's The Hurt Locker (Summit, 6.26), is every bit as white-knuckle intense as its reputation suggests. It's easy for a film to get caught up in its own hype, but The Hurt Locker is one lean, mean piece of work. It's an action thriller with a brain and a heart, but it leaves the politics at the door. That's what sets it apart from so many other Iraq war films. Bigelow isn't trying to make any kind of political statement here. The ultimate theme is what makes a soldier tick, what keeps bringing them back to put their lives on the line every day. And she's not here to offer answers or put any kind of cliche label like God, family, and country. No it's much deeper and much more complex than that. Thanks for bringing this one to my attention....looks like it will be a good one. I have not been a Bigelow fan in the past, but the trailer and your own much-respected comments make it somewhat of a must-see.